For a week before we left for our trip, there was a moratorium on all-things Disney – songs, movies, you name it. That’s because my husband and I were certain that we were about to be inundated with cheerleader-style crew members, garish decor and “It’s a Small World” choruses piped into every public restroom. How wrong we were. For about a year, the anticipation for this cruise built. 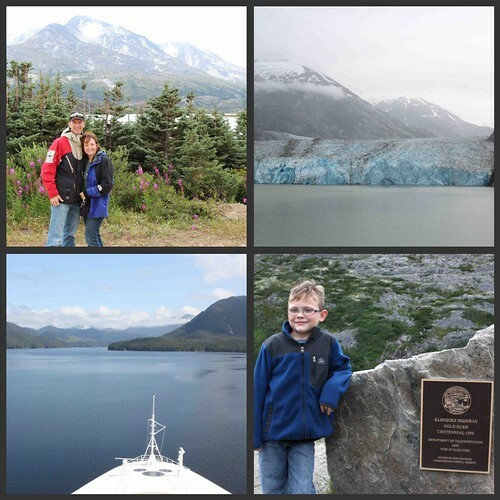 My husband, two boys (ages 9 and 7) and I were to embark on a 7-day Alaskan cruise with my parents. I think the adults were just as excited as the kids, though for different reasons. The boys couldn’t wait for the kids’ clubs and unlimited supply of soft ice cream. The adults were ready for a week of no cooking, cleaning or responsibilities. While all of these expectations were exceeded, the best part of the trip was simply that we were able to do it altogether. Sappy, I know – but really, what fun are new experiences if you can’t share them with the people you love? Prior to this trip, the biggest ships I travelled on were the B.C. Ferries that shuttle passengers between Vancouver and Vancouver Island. More than anything, I was curious to find out how one ship could house eight restaurants, five kids’ clubs, multiple bars, a movie theatre, a huge venue for live theatre, hundreds of staterooms and three pools without sinking. I kept any Titanic references to a minimum as we strolled through the multiple decks of the Disney Wonder, marveling at all the ship had to offer. Thankfully, the decor was very tastefully done. Black and white animation drawings of various Disney scenes adorned the walls and bright colors were kept to a minimum. There are several choices for staterooms and Disney seems to be known for staterooms that offer more space than those on other lines. Our room included a queen-sized bed, a couch that turned into bunk beds and the option to pull down a murphy bed to accommodate a fifth person. A toilet and sink were housed in one section, with the shower/bathtub and additional sink in another, which allowed more than one person to get ready for dinner at a time. As for storage room – well, we were able to completely unpack all of our suitcases and still had room to spare. This is one of the areas where Disney really separates itself from the pack, particularly with kids’ activities. The Disney Wonder houses five kids’ clubs, which include the Flounder’s Reef Nursery (3 months to 3 years), the Oceaneer Club (ages 3 to 10), the Oceaneer Lab (ages 3 to 10), the Edge (ages 11 to 13) and the Vibe (ages 14 to 17). My boys primarily spent their time in the Oceaneer Lab. From the Ratatouille Cooking School and soap car races to science experiments and Wii tournaments, they were kept busy at every moment by the energetic, engaging staff. 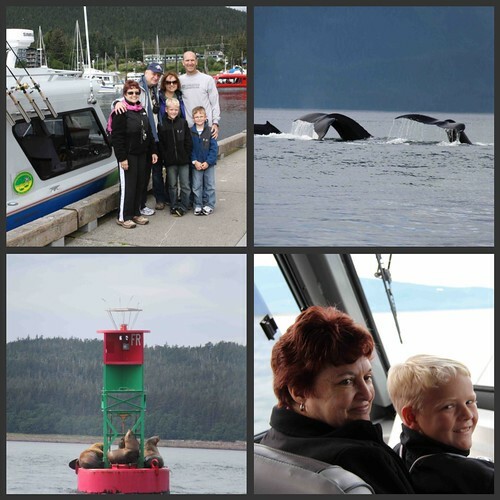 A highlight for my kids was the Junior Ranger program offered on the Alaskan cruises. Throughout the week, they attended classes taught by rangers, with subjects ranging from ocean mammals and glaciers to bears and plant life. They diligently worked on completing their ranger booklets and proudly accepted their Junior Ranger certificates and badges at the end of the week. While there were some cooler days (we were in Alaska, after all), my kids did manage to take a few plunges in the pool. They ran back and forth between Goofy’s pool, which is a basic rectangular shaped pool, and Mickey’s pool, which is shaped like Mickey Mouse’s head. Mickey’s pool was the bigger draw, as there was a one-story twisting water slide and an enormous screen playing Disney movies. While not splashing around in the pools, my older son spent his time on the sports deck, a netted-in area on the top deck where kids can play soccer and basketball. He spent hours playing pick-up soccer games with kids of various ages and we found ourselves dragging him away from the sports deck when it was time for dinner. Now, this is Disney we’re talking about, so you know the entertainment if going to be first-rate. Each night, there were two showings of the evening’s entertainment in the grand Walt Disney Theatre. Live musicals, complete with elaborate costume and set changes, included Toy Story: The Musical, The Golden Mickeys (Disney’s version of the Oscars) and and the award-winning Disney Dream: An Enchanted Classic. On other evenings, we were treated to an impressive juggling show; a guitar player who took requests from the audience, putting his spin on classics and modern tunes; and a showing of Cars 2 in 3D. We didn’t spend much time in the family and adult clubs but, from looking at the daily schedule, there were hours of bingo, family game shows and talent shows available. In addition, movies were shown throughout the day in the Buena Vista Theatre. On our second day at sea, we journeyed up Tracy Arm for a view of the massive glaciers, passing bright blue icebergs and cascading waterfalls along the way. Upon entering Tracy Arm, we were hit with rain and fog, so took a detour up a secondary inlet. We were not to be disappointed. The crew steered the ship into a small inlet that was capped by a massive glacier. Over a period of an hour or two, we sat on our verandah, marveling at the captain’s ability to maneuver the ship very close to the glacier, allowing passengers on both sides to get unparalleled views. About halfway through our stay in the inlet, an rumble of thunder cut the air as a large piece of the glacier calved off into the water. As much as we enjoyed the days at sea, the ports stops allowed us to experience a taste of Alaska. Various port activities are made available by the cruise line or through private companies on shore. Our first stop was Skagway, which is a town of 800 residents. We tripled the size of the population simply by docking there. Looking from the far end of Skagway’s main strip towards the dock, the Disney Wonder seem to loom over the town like Gulliver over Lilliput. My dad arranged an outing through a private company and we clambered onto the White Pass & Yukon Railroad for a stunning trip from Skagway to Fraser, B.C. in the Yukon. The railway was built in 1898 during the height of the Klondike Gold Rush. Climbing almost 3000 feet in just 20 miles, the trip offers spectacular views of the surrounding mountains. It was sobering to think of the gold miners that risked their livelihood and lives climbing over that pass before the railroad was built in hopes of striking it rich. Our next stop, Juneau, was the highlight of the trip for most of us. We were booked on a whale-watching excursion through a private operator called Best Damn Charters. They are a father and son team, originally from Minnesota, that offer whale watching and fishing trips for 1 to 6 people on their 26-foot craft. Being the “Best Damn” of anything is a lot to live up to, but Duane and Nick came through with flying colors. We spent the morning surrounded by a pod of at least a dozen Humpback whales. Watching these majestic creatures arch above the surface, cutting through the water to organize themselves to bubble feed, can make one feel rather small and insignificant. To enable passengers to take advantage of the ship’s plethora of restaurants, Disney runs a rotational dining system. For dinnertime, we rotated between the three main restaurants, accompanied by our head server, Hans, and assistant server, Satya. The kids were thrilled to arrive at the table each night to find water cups with their names written on them. Satya promptly brought them Shirley Temples (their current beverage of choice) and all the maraschino cherries two boys could ever hope for. Both servers were personable, entertaining and willing to do whatever they could to make our cruise pleasant. This could be said for all of the crew on the Disney Wonder. 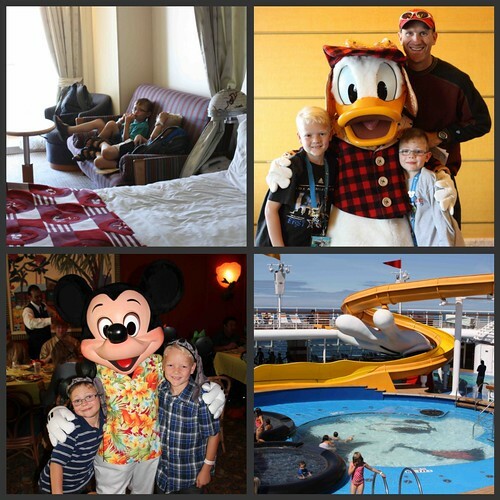 We embarked on the cruise expecting that Disney’s focus would be the kids’ activities and entertainment, not the food. This was accurate, to some extent. 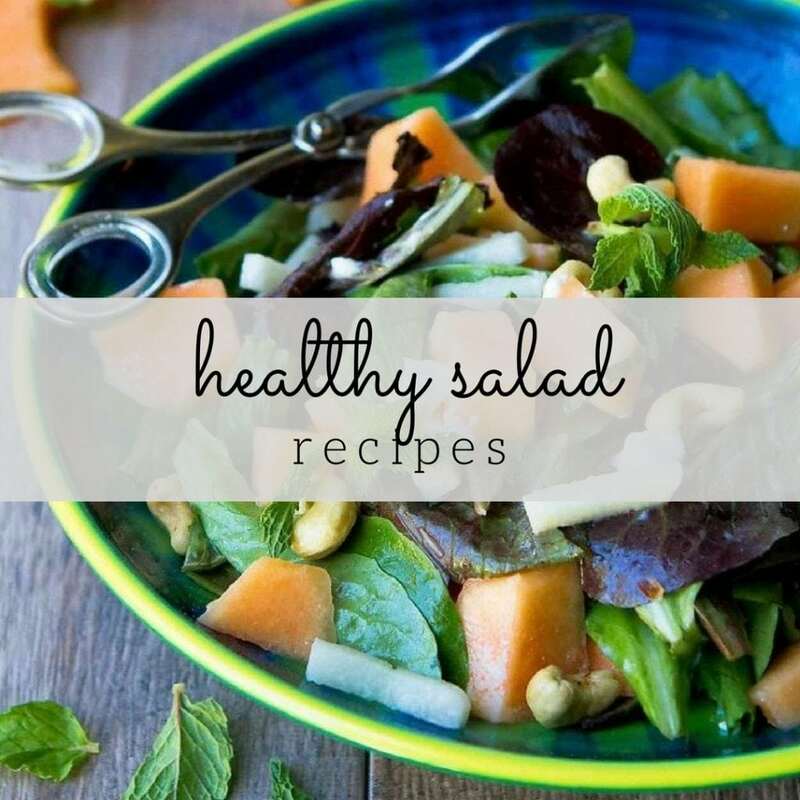 Overall, the choice and freshness of the fruit at all meals was abundant, the choices were varied and, quite simply, there were mass quantities available. We did have some very good dishes but were left wishing for more availability of vegetables and higher quality of preparation. One exception was Palo, the adults only restaurant, which my husband and I dined at after a luxurious couple’s massage in the spa (it was our date evening – thanks, Mum and Dad). The dinner in Palo was excellent, with some of the highlights being the antipasto platter, the lobster mascarpone ravioli, the beef tenderloin with Barolo sauce and the chocolate souffle. This was my first cruise, so I don’t have anything to compare to, but I will say that we had a magical vacation. Not only were we able to spend time as a family, enjoying some wonderful time with my parents, but we left the cruise feeling relaxed and energized. The crew of the Disney Wonder made our trip so pleasant in every way and I have no reservations in recommending this cruise to other families. Did my kids have fun? Well, from the tears shed on the final night at dinner, I think it would be safe to say it was the trip of their young lifetimes. You can’t ask for more than that. Tracey, Alaska is a stunning place to go and traveling by ship allows you to sneak into some of the areas with glaciers, such as Tracy Arm. So glad you ventured away from food to give us this recap! I’ve always put Disney Cruises in the category of being way too kid-focused and obnoxious for me, but I think you’ve proven that theory wrong. I’m definitely going to mentally bookmark something like this for later. Alaska looks and sounds amazing, so glad you had such a great time! Thanks, Annalise – we really did have a wonderful time. Disney definitely runs a very family-friendly cruise. Glad you shared with us your vacation recap. I’ve never been on a cruise or Alaska. Both seems to be a great vacation package! Kiran, I was a newbie cruiser too and really didn’t know what to expect. While we like to travel on our own itinerary too, we would certainly consider another cruise. Thank you for sharing..great pics..lovely family. Thanks, Monique. I hope your daughter gets a chance to do a cruise like this. What a great post, Dara! Peter and I went on a Disney cruise to the Caribbean several years ago and fell in love with it. We have been on several cruises (all on Roayl Caribbean–love them! ), and the Disney cruise was our first on that line. We were also expecting “all Disney, all day”, but were incredibly impressed with how tastefully the ship was decorated and how the Disney theme was incorporated just as tastefully everywhere without being “in your face” 24/7. We loved the rotational dining system, especially. 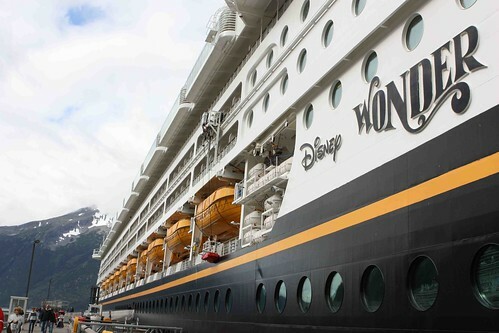 I had no idea Disney cruises went to Alaska, and we’ve been dying to go to Alaska for years. This might just be our next cruise! P.S. Your boys are adorable! Flavia, Disney just started to run cruises to Alaska this year. Currently, they are running out of Vancouver, but next year that will change to Seattle. Thanks so much, Soma. We will have albums full of memories, that’s for certain. i’m so glad to hear you had a good time on with this cruise line. i went on my first (and last) Carnival cruise this February. The Food at Dinner was actually good, but the cabin super tiny with 3 adults, and the same repetition of bkfst items, buffet style really got old and tasteless buffet desserts. We did go to the Caribbean, so that was pretty awesome, 3 countries in 3 days with HOT weather when all my fellow Canadians were freezing. Hmm, it does sound as though you didn’t have the ideal trip on Carnival. The stateroom size on the Disney Wonder really made the 7 days enjoyable. It gave us the luxury to spread out a little and not feel as though we were constantly on top of each other. What a lovely vacation! We’ve never done a cruise but after reading your post I think it will be something we need to do once our little one is older. Welcome back! It really is a fun way to travel with kids. Lots of opportunities for exploration for the kids, plus a little R & R for parents. I’m so happy to hear you a fantastic time. Reading this definitely makes a cruise vacation something I’d like to do in the future. It’s so great you got to share a trip with your parents and your kids while all enjoying it. Something to treasure for a long time! Welcome home!! Thanks, Kelley. Sharing this trip with my husband, kids and parents really was the best part. You are definitely a seasoned Disney cruiser. That speaks volumes for the quality of their vacations. I have never been on a cruise, but I would like to someday. I live in a cruise ship city, we have several dock each week. Next summer, the Disney cruise lines are going to be stopping here as well, I can’t wait to see the ships! It looks like you had a great time, someday when I get to go, I think this might be one to consider! 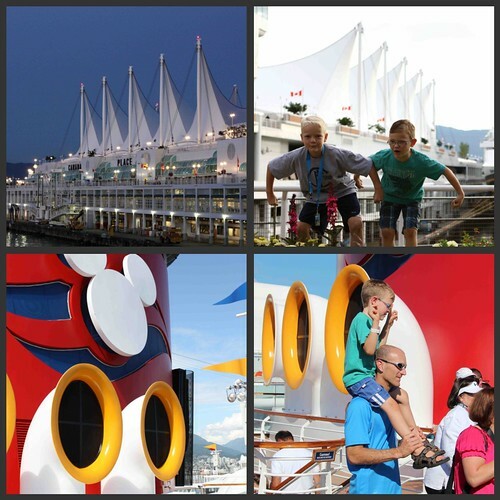 Our cruise ship left from my hometown of Vancouver (I don’t live there anymore) and it was such fun to explore the city for a few days ahead of time. Italy…that would be wonderful! it sounds as though you are a very seasoned cruiser. An Alaskan cruise has been on my need-to-do list for a while now, we’re hoping to go next summer. If anything, it would be to be surrounded by all those humpback whales – amazing! Melissa, the Humpbacks really were a highlight of the trip. Get to Alaska when you can – it’s worth the trip! What a fantastic vacation! The boys certainly look so happy in all the beautiful photos! Thanks, Maris. They had a ball. Sounds like a perfect vacation. Glad you had a great time. Thanks, Barbara. It certainly was a vacation to remember. Wow!! So jealous of your trip. So you’re pretty much saying “everyone needs to go on this”! 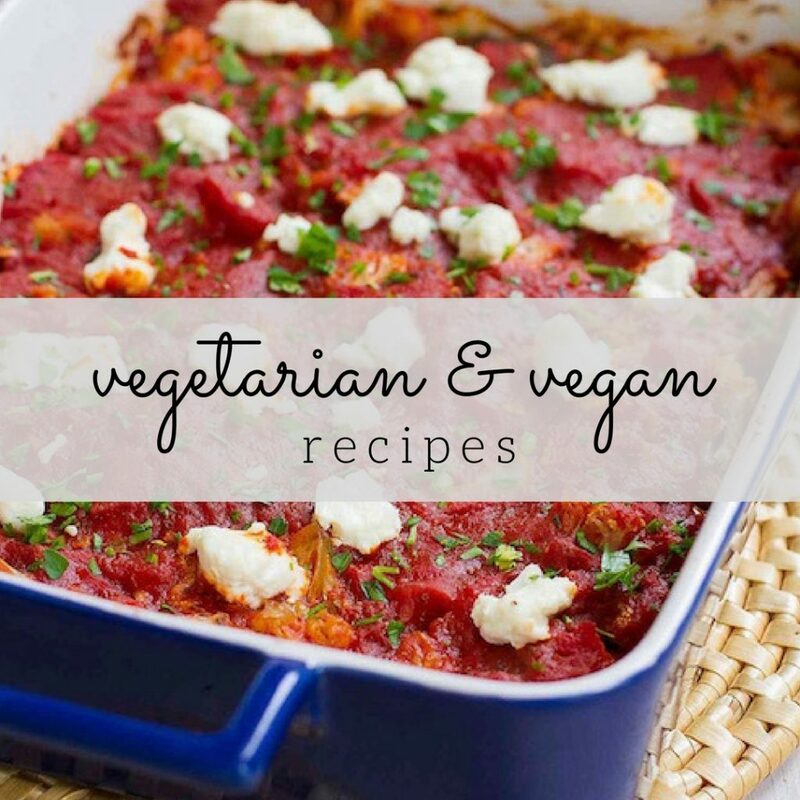 I am going to look into this. Awesome. What an amazing trip Dara! 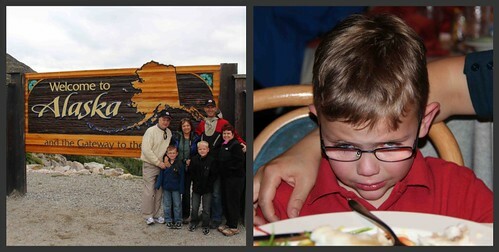 You and your family are so lucky to have had such an amazing experience – I want to be a big kid too! And those humpback whales and glaciers – incredible! What a great report, Dara! So glad you all had such a fabulous time. 🙂 I loved all your photos and hearing the details. I especially love that photo of your mom and son. It’s lovely to see the shared profiles and family resemblance. You’ll treasure that photo forever. We’ve done one cruise previously when our son was small. It was a Big Red Boat Looney Tunes cruise and part of a Disneyworld package. We enjoyed ourselves and he had a ball, but we decided that cruising was not our cup of tea. We like to spend much more time on land checking out the local experiences, BUT the exception will be an Alaskan cruise. We do plan to do one of those in the future. I didn’t know that Disney did Alaskan cruises either. So jealous!! I’ve been on a few cruises, but never a Disney cruise, and never to Alaska. I can’t wait until my kids are old enough to really appreciate something like this, and I’ll be there in a heartbeat. What a great vacation you had!!! Couples massage, multiple restaurants, no cooking, cleaning & magical moments?? Count me in! Can I get a Ranger Card too?! By the way: you are an excellent travel writer! Must do this! I am so jealous, it looks like you guys had the best time! That really sounds like a perfect family vacation! Glad you had such an amazing time! 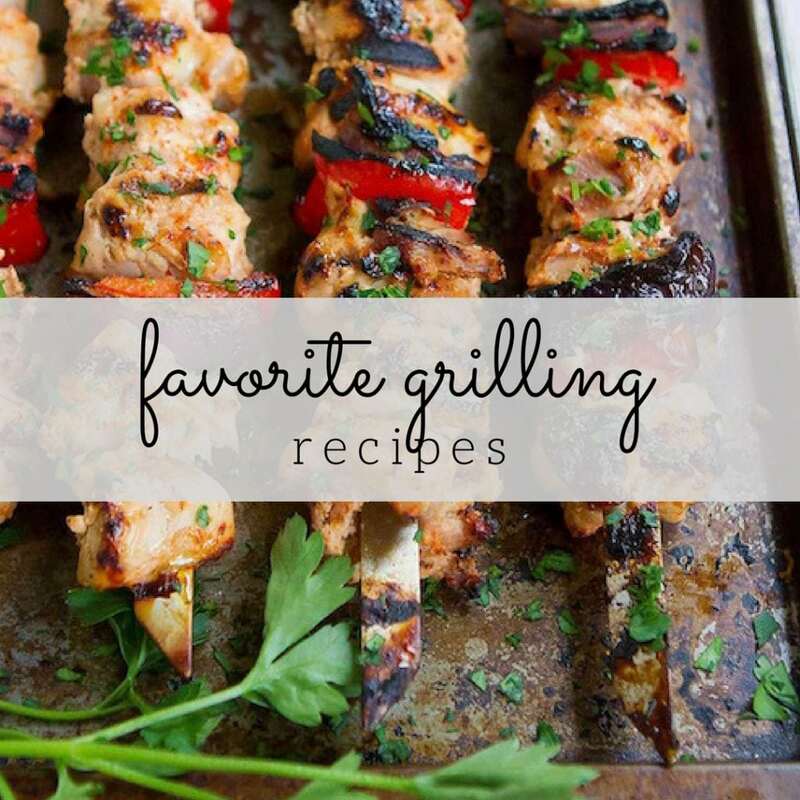 Sounds like you had a fantastic time! That photo of your little one crying….awwwww…how sweet! If I wasn’t a big kid, I would cry, too. I love seeing the photos. It looks like you all had a wonderful time. I’ve only been on one cruise, but can’t wait to do it again. And yes, it is sad when those kind of good times are over, sigh! I sailed the Wonder to the Caribbean years ago when my kids were young and I’ve taken a cruise (different cruise line) to Alaska – what a perfect marriage of the two you did! 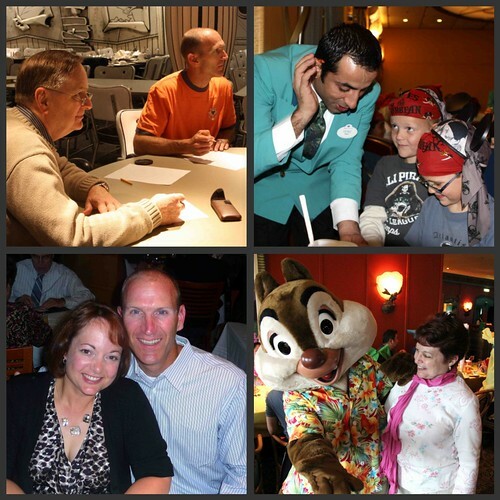 Disney cruises are by far the best – I’ve done two other “popular” cruise lines and they didn’t compare. Wow, loved seeing your great pics with family and the wonderful sights! Just fabulous! Loved this post! I was dragged kicking and screaming onto a Disney cruise (the Magic) a few years ago. But you know what? I loved it. The ships are beautiful and everyone had a great time. It was wonderfully kid-friendly, modern, and clean. Now my husband and I want to go again! I can’t tell you how much I appreciated your review of your cruise. My husband and myself are set to leave on a Disney Eastern Carribean cruise in just a few short weeks and we will be traveling with no kids. We have heard such wonderful things about Disney, as we seem to love all things Disney, that we thought why not. Your review has just reaffirmed my decision. Life yourself, my BLOG is normally dedicated to interior design but I will plan on highlighting my trip when I return to the states. Meredith and I had our honeymoon on the Star Princess in Alaska. A very similar itinerary to yours. It was amazing! What a fabulous trip! I would love to take our family on a Disney cruise someday – I didn’t realize they went to Alaska, that’s so fun. Did you have to have passports to go on this cruise? It looks like a blast! Kendra, we did need passports because the ship departed from Vancouver, Canada. However, I’ve heard that they will be changing the departure port to Seattle next year for the Alaska cruises. In that case, you probably won’t need a passport, assuming you’re not docking in any Canadian ports. Thanks, again! I would love to do Alaska! Mariel, I hope you have a chance to go on one of the Disney cruises. It really was a fantastic vacation for all of us! Hi Dara. I absolutely loved reading your post. All the excitement of your aventures and most of all the time you were able to share with the entire family. I am “Stoked!” to say we will be going on our first Disney Cruise next month (July 23rd to the 30th) and where to, you might ask? ALASKA!! (Time to do the happy dance…. WOO HOO!!…). Now that I’ve calmed down a little and returned to Earth, I am very excited to say that my kids, Alexia and Jazmine, don’t know. They are going to be soooo surprised! My husband and I have been planning this for the last 7 months, how we managed (mainly my husband) to keep it a secret… couldn’t tell ya but It’s going to be the greatest thing in the world to finally breaking the news to them.. This is going to be AWESOME!!! dresses 2014 differ from other bridesmaids dresses. so that the fat is distributed evenly straight down your back and onto your hips, rather than pulling on your spine.